The death toll related to Florence has continued to rise. At least 40 people have been killed as Florence battered the coast off North and South Carolina on Friday and into the weekend. As of Thursday morning, the North Carolina Department of Public Safety updated the number of storm-related fatalities in the state to 31. The South Carolina Department of Public Safety reported having eight storm-related deaths, including two women who drowned Tuesday night when a van taking them to a mental health facility was swept away by floodwater. Officials in Virginia reported one death related to tornadoes connected to the Florence system. Lesha Patrice Johnson, 41, and her 8-month-old son were killed when a tree fell on their house in Wilmington. The child's father, Adam Zachery Johnson, 48, was also home, and he was taken to the New Hanover Regional Medical Center for treatment. He remains in fair condition, as of Tuesday afternoon, according to Wilmington Police. The family was trapped for several hours as firefighters tried to rescue them. The large size of the tree made it difficult, Wilmington Fire Department Chief Jon Mason said during a Friday afternoon press conference. Firefighters used heavy lifting, air bags and saws in what was an emotional rescue. The photo below showed firefighters praying at the scene. The third death happened in Hampstead, Pender County when a woman had a medical emergency and EMS crews could not get to her due to the storm, according to Tom Collins, Director of Emergency Management. She died Friday morning. A 68-year-old man was electrocuted at a residence on Silver Smith Circle Friday morning when he was trying to connect two extension cords outside in the rain. His body was discovered by family members. A 77-year-old man was found dead at 8 a.m. Friday by his family at his home on Middle Street in Kinston. Officials believe he died of a cardiac event when he went outside to check on his hunting dogs late Thursday night, according to the NC State Emergency Response team. Both deaths were reported to the State Medical Examiner’s Office by the Lenoir County Sheriff’s Office. Officials in South Carolina reported the state's first fatality due to Florence on Saturday. 61-year-old Amber Dawn Lee was killed late Friday when her vehicle struck a tree that had fallen across the highway. No passengers were in the vehicle at the time of the crash, and Captain Kelley Hughes of the South Carolina Highway Patrol said that the woman was wearing her seatbelt. Four people were killed in flash flooding and swift water on roadways in Duplin County, NC, the Duplin County Sheriff’s Office confirmed. Three people died in separate vehicles on Saturday and one person died during a water rescue on Friday, the Sheriff's Office said. An 81-year-old man fell and struck his head while packing to evacuate Wayne County, NC on Friday, according to a release from the NC State Emergency Response team. A 68-year-old man and his wife died in a house fire in Cumberland County, NC on Friday, according to a release from the NC State Emergency Response team. Preliminary reports indicate that the fire was caused by a candle being used while the power was out, NCPD confirmed. 61-year-old Debra Collins RIon and 63-year-old Mark Carter King died from carbon monoxide poisoning from a generator used in their home. The Horry County Coroner's Office said that they were found in their home on Saturday afternoon, and died Friday night. A fatal collision on Saturday morning left two injured and one dead in Georgetown County, SC. According to the South Carolina Department of Public Safety, a pick-up truck drove into standing water on the road and lost control, overturning into a ditch. Two people were transported to the hospital. 23-year-old Michael Dalton was pronounced dead at the scene. The conditions and identity of the two transported to the hospital were not immediately available. The South Carolina Department of Public Safety reported a fatal collision in Kershaw County on Sunday morning. The driver of a pick-up truck died at the scene when the vehicle traveled off the roadway, striking an overpass support beam. A driver in a pickup truck drove standing water and lost control of the vehicle near Gilbert, SC on Sunday morning, according to the South Carolina Department of Public Safety. The vehicle hit a tree, and the driver died at the scene. A 3-month-old child died Sunday afternoon after a tree fell on a mobile home in Gaston County, NC, according to the county commissioner Tracy Philbeck. The family shared a photo of the baby, Kade Gill, with NBC Charlotte. They said his mother was holding him when the tree came crashing down. The mother was rushed to the hospital and was in stable condition. Also in Gaston County, a 25-year-old man who was a passenger in an SUV died on Saturday while not wearing a seat belt. Officials found the body of one-year-old Kaiden Lee Welch Monday morning after he was swept away by floodwaters. 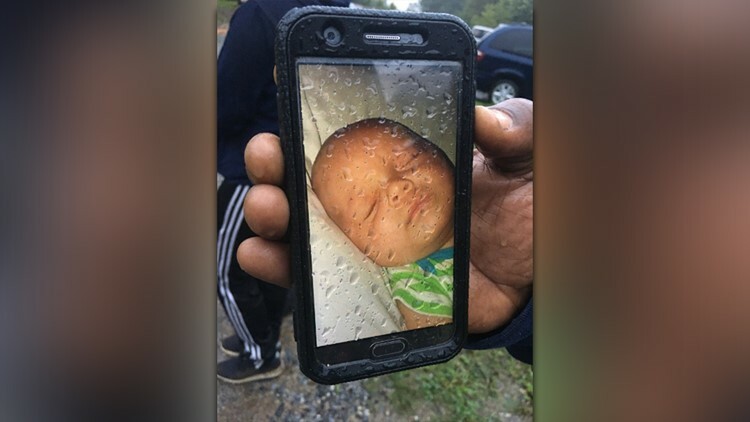 The Union County Sheriff's Office said Deja Lee, the child's mother, was driving with her son along NC 218 in Union County when they came upon a barricaded road and eventually got trapped in rushing floodwaters. Deputies have said that Lee drove through barricades, but she told NBC Charlotte there was no barricade telling her about the dangerous situation ahead. The Union County Sheriff's Office said Lee managed to free herself and Kaiden, but the fast-moving water was just too much for the mother and she lost her grip. The body of an 88-year-old man has been recovered in Marshville, NC after floodwaters receded, according to police on site. The Union County Sheriff's Office announced Monday that a passing motorist found the body. The man was driving across a flooded road when his car ran off the road. His car window was down, indicating he might have tried to get out of the car, according to authorities. The body of a 52-year-old man was discovered on the back porch of a house damaged by the storm on Saturday. A 37-year-old man died in a car crash after hydroplaning across the yellow line and hitting another car. A 73-year-old man died from respiratory complications after his house lost power and could not longer use his oxygen concentrator. Another man collapsed and died while trying to assist an evacuee. He was 62. A 61-year-old man died while evacuating from Wilmington on a moped this Sunday. 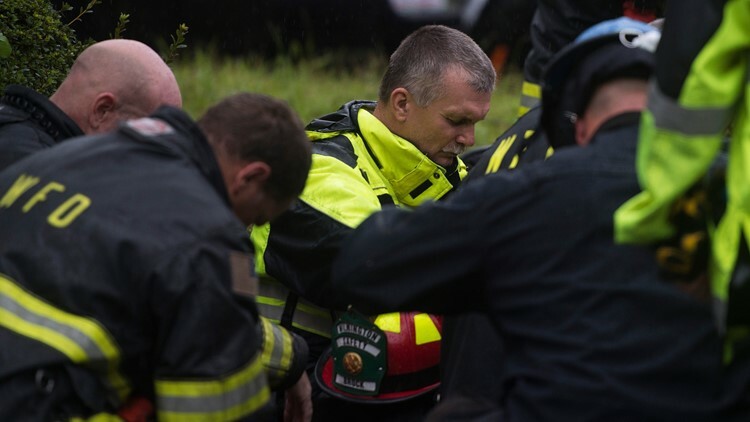 A 56-year-old man died after his tractor-trailer hydroplaned and ran off the road this Sunday. A body was recovered from a discovered vehicle that had washed off the road on Monday. A 73-year-old man and a 65-year-old man after their cars were submerged in Scotland County, NC. They were in separate cars. An 83-year-old man died in a car crash in a washed out roadway and collided with a cement culvert, according to the North Carolina Department of Public Safety. No other vehicles were involved in the crash. Several tornadoes were reported Monday afternoon in central and southern Virginia. One person was killed after a building collapsed in Chesterfield, Va.
A 46-year-old woman was killed in Rutherford County when a tree fell on her vehicle while she was driving, the Associated Press reported, citing a spokesperson from the North Carolina Department of Public Safety. A sheriff's office van was carrying two women detainees and two deputies from Conway to Darlington on Tuesday night when it was overtaken by flood waters near the Little Pee Dee River. 45-year-old Windy Wenton and 43-year-old Nicolette Green died. Two deputies were rescued from the top of the van, and Horry County officials say that they tried to get the two women out. South Carolina police confirmed the death of an 81-year-old man found in his vehicle submerged underwater off Carolina Church Road on Wednesday. This is the ninth storm-related death in the state. Editor's Note: A previous version of this article reported two deaths in Carteret County, North Carolina. The Carteret Country Sheriff's Department confirmed that these two deaths initially reported as a result of Florence were a result of an apparent murder-suicide.